Energy and Climate Change Secretary Amber Rudd marks World Environment Day by visiting the Thames Barrier, which is crucial to protecting our environment and offers protection from the impact of climate change. 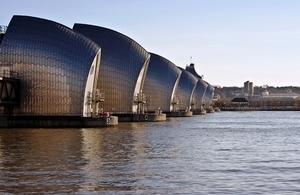 The Energy and Climate Change Secretary Amber Rudd today chose to mark World Environment Day by visiting the Thames Barrier, which is crucial to protecting our environment and offers protection from the impact of climate change. The visit is Amber Rudd’s first as Energy and Climate Change Secretary.